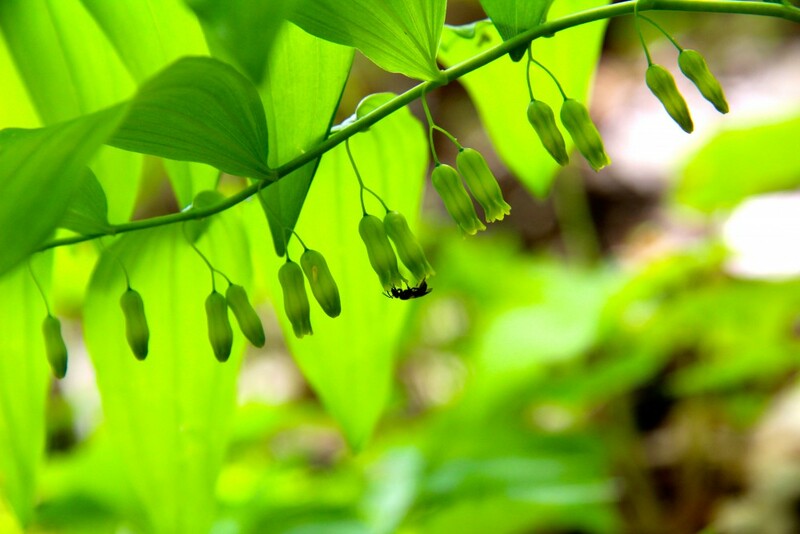 The pendant flowers of Solomon’s Seal are hidden under the leaves. This handsome woodland plant grows upright as an unbranched stalk of alternating, oval leaves. The leaf edges are smooth. The plant has a look-alike, false solomon’s seal, but the two are easy to tell apart if the plants are in bloom. The flowers of solomon’s seal are born underneath the leaves, as seen in the photo above. The nodding, bell-shaped, white to greenish flowers dangle in groups from the axils of the leaves. By contrast, false solomon’s seal has a terminal inflorescence—an airy cluster of whitish flowers appears at the tip of the stem. You can see photos of false solomon’s seal in the next post. Both plants grow from underground rhizomes and form clonal colonies in the forest. The fruit is a berry. Both have been used medicinally for a variety of ailments. These plants are frequently planted in flower gardens because they are shade tolerant, spreading– but not invasive, and the foliage is beautiful. A popular cultivar is variegated (green with white stripes).